Mérida region in the Venezuelan Andes and Los Llanos. The dawn breaks in the foothills of the Andes Mountains and begins to burn away the morning fog. The snow-capped peaks stand majestically in the crisp air, greeting the morning sun. As the sky clears, you catch a rare glimpse of an Andean Condor soaring royally in the deep blue sky. The next day you are in the Venezuelan plains called Los Llanos. You awake before dawn. The sun begins to rise over the grasslands that are caressed by an early morning breeze. The sound of hundreds of parrots awakening breaks the silence. You and your travel companions climb out of your beds to see the sunrise and experience the wonder that is Venezuela. This unique natural and wildlife adventure experience and many others like it can be yours on Angel-Eco Tours’ six-day/five-night nature, wildlife and bird watching adventure travel package to the regions Mérida and Los Llanos in western Venezuela. On this adventure trip, you will experience a variety of ecosystems: highlands, cloud forests, alpine regions with glaciers, plains and wetlands. 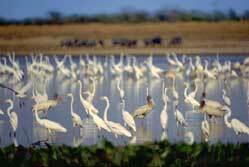 The diversity of wildlife and birds is also stunning in the Llanos. From the safety and comfort of jeeps, you will get a chance to see crocodiles, armadillos, capybaras, caiman, howler monkeys, anacondas, giant anteaters and many other exotic creatures in this remarkable ecosystem. In both locations the trip is a particularly extraordinary visual feast for bird watchers. Over 350 species of birds inhabit the mountainous region of Mérida and the Paramos highlands, including the sword-billed hummingbird, the Andean condor and the black-chested buzzard eagle and more than 1,200 species of birds inhabit the wetlands / plains of Los Llanos. In short, there are ample opportunities for wildlife, nature and bird watching and photography. Click here to view an extensive bird, animal and mammal list for the llanos. You will visit the friendly native Andean people, called Andinos. The towns and villages of the Andinos date back to Spanish colonial times. 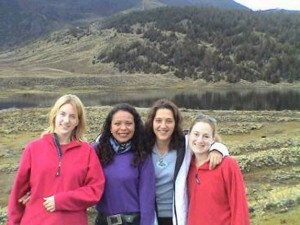 On this Angel-Eco Tours’ adventure travel package, you will be taking moderate high-altitude walks and hikes. Of course, this trip can be customized to suit your needs. Guided tours run year-round. Departures are bi-weekly, on Saturdays from Caracas; depending on the size of your group other departure dates may be arranged. Of course, our itinerary is completely customizable to suit your adventure goals. This trip can be customized for any number of persons. Prices available on request. Moderate to demanding - depending on the day tours you select. Touring includes some high altitude walking and hiking. You will be staying in comfortable posadas, which are guest houses that include all amenities (beds, showers, toilets).